Staff Selection Commission conducts several recruitment exams every year. Some of the main exams are Common Graduate Level (CGL), Combined Higher Secondary Level (CHSL), GD Constable, SI ASI in CISF, CAPF, NIA, Junior Engineer (JE) etc. Here you will find all SSC Exam Result 2016 updates. This page will update you as soon as any SSC Result got announced. SSC CHSL Result 2015 - 22 July 2016. 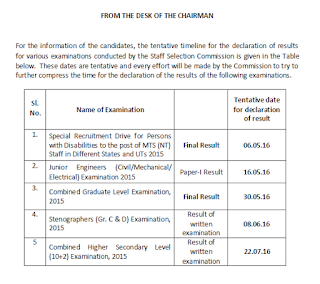 SSC JE Result 2015 (Paper 1) - 16 May 2016. 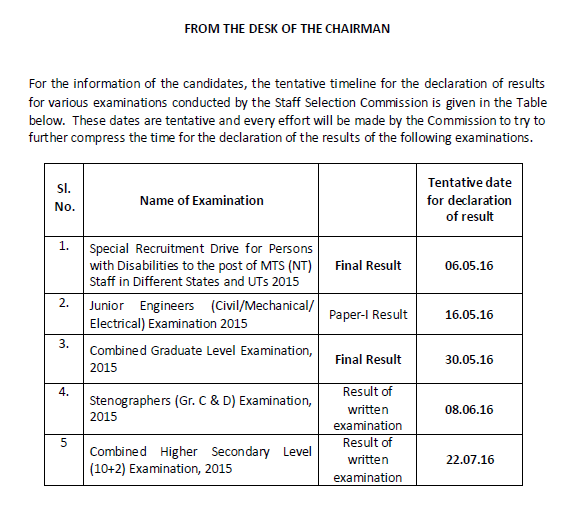 Staff Selection Commission had conducted Tier 2 exam tier 1 exam on 25 & 26 October 2015. Every year, lakhs of candidates appears for this test which is held at thousands of centers in India. Tier 1 exam had alread been held for which result had been announced. Now It is likely that SSC CGL Tier 2 Result 2015 will be declared in December 2015. Marks / Score card will be released within a week from declaration. You can check SSC CGL Exam Result 2015 and Marks obtained by visiting the direct link given above. Staff Selection Commission had successfully conducted Constable GD written exam 2015 on 04 October 2015. The selection for these posts is to be done through PET/PST, written exam and Medical exam. Many number of candidates had attended in Physical Standards Test and Physical Efficiency Test at centres determined by the Commission in consultation with the CAPFs. Those who qualify physical test have appeared for written test. Now SSC is in the process of preparation of GD Constable result. Soon it will process the result / merit list of candidates who had appeared in this offline exam. Staff Selection Commission had organized Combined Higher Secondary Level exam on 01, 15 & 22 November & 06 & 20 December 2015. The test was held for the posts of Lower Division Clerk (LDC), Data Entry operator (DEO), Postal Assistant (PA), Sorting Assistant (SA) in various govt. ministeries / deptt.. The commission is now in the process of analyzing the OMR sheets of the candidates and preparing the results. Now it is confirmed that SSC Result of CHSL 2015 will be announced on 22 July 2016. You can check it from above after announcement.